An audience gathered at my studio. 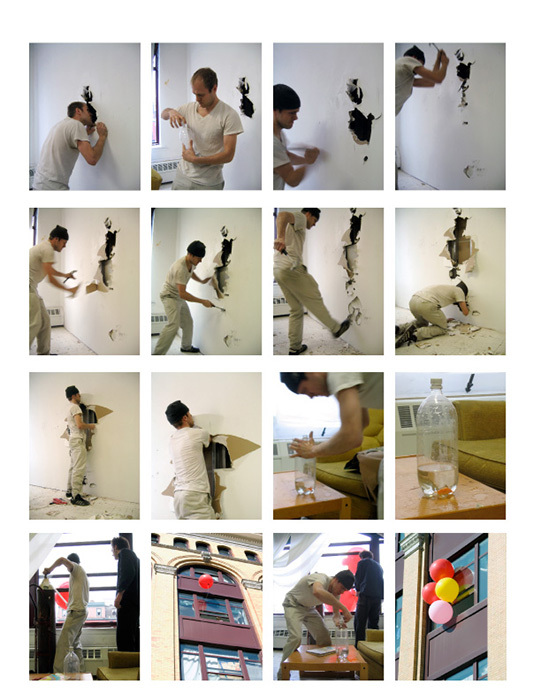 The studio wall was penetrated to reveal numerous items including a live goldfish, a bottle of water, balloons, string, and the book, Oh the Places You’ll Go by Dr. Seuss. The book was read to the fish before it was carried away by the balloons out of the studio and into the sky. 1. To confront the role of the artist’s studio in the process of making art, and to express the frustrations of working within it’s confines while also accepting and capitalizing on surprises that can occur within it’s walls. 2. To let go of complete control over a work by making a piece which has no known ending for one audience (audience in the studio) and no known beginning for another audience (audience where the fish ended up).